A laboratory process whereby a primary oocyte obtained from an immature tertiary follicle is allowed to mature until it becomes a secondary oocyte and capable of being fertilized by a sperm cell. A laboratory process whereby a primary oocyte obtained from an immature tertiary follicle is allowed to mature until it becomes a secondary oocyte and capable of being fertilized by a sperm cell. 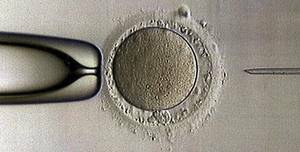 Fertilization is then performed in the laboratory by use of using in vitro fertilization. This process is often used to increase the number of egg cells available for IVF so as to increase the chances of successful fertilization, implantation, and pregnancy. The fertilization rates of oocytes matured in vitro are much lower than those in in-vivo stimulation cycles. Although a proportion of immature oocytes are able to mature in special culture media, the use of cocultures to improve maturation is novel. We are examining the effects of in vitro maturation of oocytes using various culture conditions and examining the oxidative stress generated in the conditioned media. Optimizing the culture conditions may help improve the maturation, morphological quality, and reduce apoptosis of immature oocytes. The goal is to develop optimal culture conditions that may subsequently help preserve the fertility potential in these patients. In addition, ongoing studies are also aimed at examining the hypothesis that the pro-antioxidant profile of the various compartments of the bovine follicle is dynamically regulated during progressive stages of antral development. Markers examining the alterations in oxidative stress and antioxidant levels in bovine follicular fluid and conditioned media from antral follicles during different stages of development are being studied. Also identifying changes associated with the follicle size, presence of dominant follicle and the stage of the ovarian cycle are being examined. Only about 400 of the one million oocytes present at birth will be ovulated, while the rest will die by atresia. The ability to rescue oocytes destined to die and mature them in vitro would provide invaluable information about folliculogenesis and oocyte maturation, and could provide oocytes for infertile women. In vitro maturation (IVM) is challenging in the human because folliculogenesis is a lengthy process encompassing many complex cellular changes in the oocyte and its surrounding follicle cells. A few live births have resulted from the maturation and fertilization of immature human oocytes aspirated from small antral follicles. Furthermore, it is possible to grow primordial follicles to pre-antral stages in slices of ovarian tissue, and support antrum formation in isolated pre-antral follicles. However, we are still a considerable way from growing and maturing pre-antral follicles to pre-ovulatory stages in vitro. The importance of the follicular environment for producing a healthy and developmentally competent oocyte is illustrated by the oocyte's susceptibility to errors during meiosis. This counsels considerable caution in the development of IVM for clinical application.